KIHU – Research Institute for Olympic Sports, works for Finnish sports. 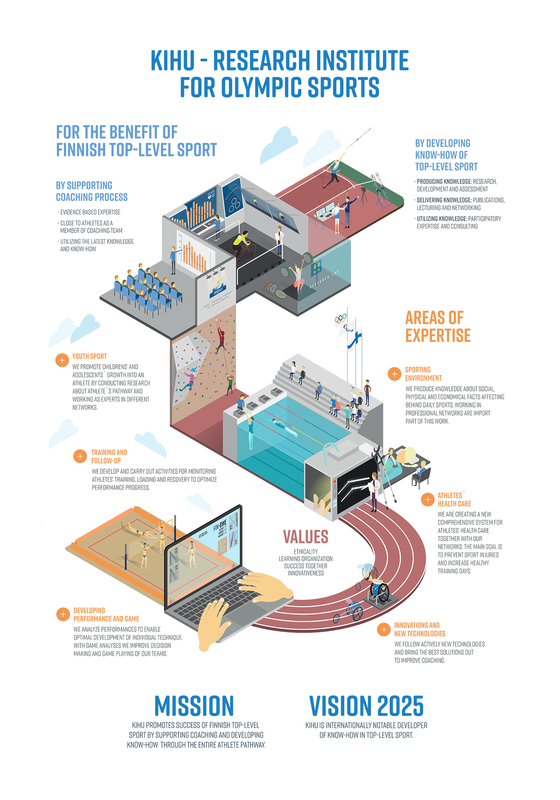 Its mission is to promote Finnish top-level sport through advanced, innovative and ethically responsible applied research and development and expertise activities. KIHU started in 1991. The research institute employs thirty-five experts, researchers and members of technical staff, representing various fields of biological, behavioral and social sciences. The members of the Executive Board of KIHU Foundation represent the Finnish Olympic Committee, the University of Jyväskylä, the City of Jyväskylä and sports associations. KIHU is part of a network of operators in the field of competitive sports, collaborating with organisations such as the Finnish Olympic Committee, the Paralympic Committee, the University of Jyväskylä, training centres, sports academies, research institutes and sports federations. KIHU is responsible for leading the Research and Development Programme of the Finnish Olympic Committee’s High Performance Unit, developing and implementing research, development and coaching expertise within elite sport. This is to ensure that Finnish athletes, coaches and other stakeholders have the latest know-how at their disposal. Participatory expertise activities aim to create, develop and share information and know-how with athletes, coaches, national sports federations and local sports associations. These activities are part of the elite sport programme coordinated by the Finnish Olympic Committee. The athlete’s path starts in childhood. We cooperate closely with sports associations so that children and youth of the future would also find the world of sports inspiring. For our part, we promote an operating model in which home, school and parents create the prerequisites for acquiring physical skills and adopting a sports-friendly lifestyle. By supporting children’s physical activity, we create opportunities for both a sports-friendly lifestyle and growing into a top athlete. In elite sports, our experts are part of an athlete’s coaching team. They participate in the planning and follow-up of coaching and training depending on the needs and practices of the particular disciplines. Practical support may take the form of physiological measurements, technique analyses, match analyses as well as enhancement of skills, for example. We are known as a strong expert in applied sports research. Our research activities cover the entire Athlete’s Path: from the study of physical activity in childhood to the development of training methods of top athletes. The research areas include, among others, sport biomechanics, sport physiology, sport psychology, sport pedagogy and sport sociology. Our research and development work is based on an elite sports research programme and practical requests coming from the field. Usually, we carry out our R&D activities, both in Finland and internationally, through our network of partners. One of our long-term partners is the University of Jyväskylä. One of our most important tasks is to develop and share know-how to support Finnish sports policy makers in their work. We acquire, edit and distribute information both for various sports organisations and individual athletes. We also carry out studies and prepare reports for different operators. Our research generates novel information which we share in seminars, congresses, websites and social media as well as through our participatory expertise activities. Publications about top sports constitute another important information sharing channel. Our assessment and follow-up functions provide athletes, coaches and other stakeholders with reliable information, helping them to decide on measures for reaching their targets. We are responsible for development, assessment and follow-up activities in respect of the Athlete’s Path. We carry out various assessment projects and equip the different parties with tools that provide feedback and help to analyse results and impacts. We are also involved in the development of a follow-up and assessment network for Finnish sports in cooperation with the Finnish Olympic Committee.